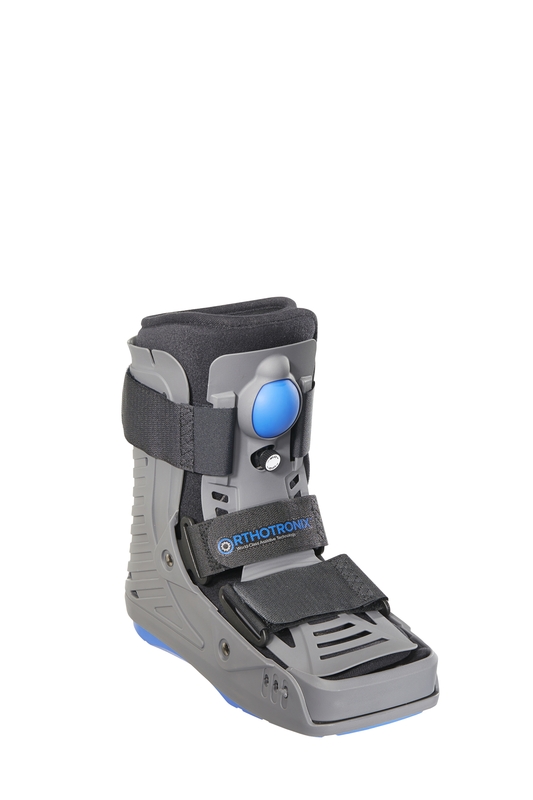 The Orthotronix Closed-Toe Air Cam Walker Boot is medically designed to protect the foot and ankle while providing superior support, assisting in a faster recovery time. The specially designed removable toe guard provides ideal coverage and added protection of the foot and toes. 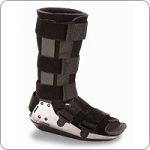 This boot is engineered to support and protect your broken toe, metatarsal fracture, stress fracture, sprain, post bunion surgery, or any other type of toe, foot, or ankle injury where you are required to immobilize your foot, yet need to continue with your daily activities while you heal. The arching rocker design encourages a smooth gait and more natural step that takes less energy, making it easier to get around and continue with normal daily activities. The fully integrated inflatable air-liner has an easy release technology for increased comfort and customized compression for further immobilization of the lower leg, ankle and foot to assist in the healing process. The cushioned heel provides for greater shock absorption. Used by orthopedists, podiatrists and physical therapists post-surgery and during rehabilitation following trauma and injury of the leg/ankle/foot. If you are in between sizes, according to the measurement chart, select the larger size. 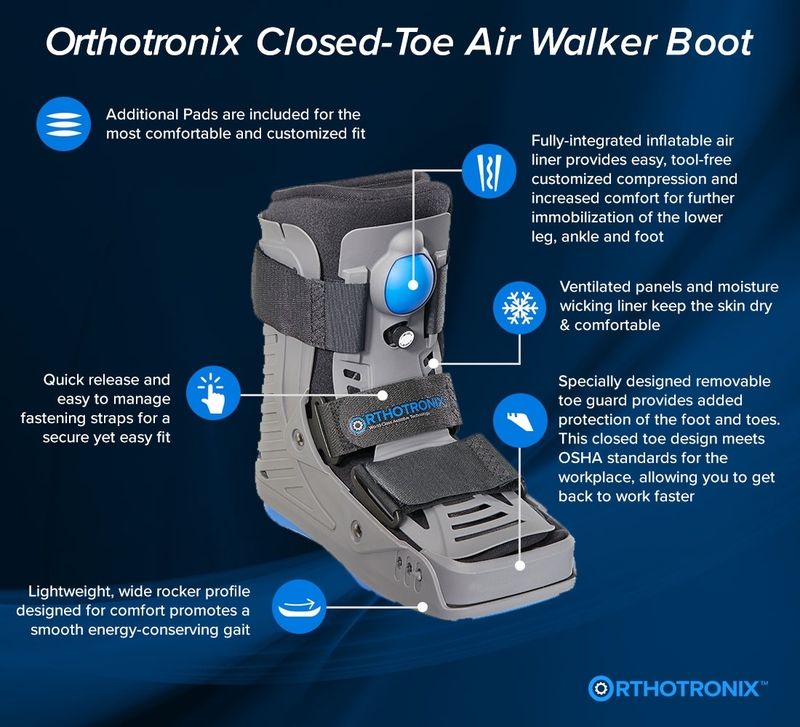 · The Orthotronix Closed-Toe Air Cam Walker Boot is medically designed to protect the foot and ankle while providing superior support, assisting in a faster recovery time. The specially designed removable toe guard provides ideal coverage and added protection of the foot and toes. This boot is engineered to support and protect your broken toe, metatarsal fracture, stress fracture, sprain, post bunion surgery, or any other type of toe, foot, or ankle injury where you are required to immobilize your foot, yet need to continue with your daily activities while you heal. The arching rocker design encourages a smooth gait and more natural step that takes less energy, making it easier to get around and continue with normal daily activities. 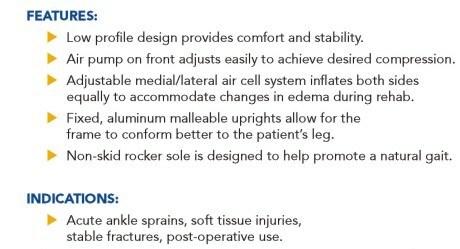 The fully integrated inflatable air-liner has an easy release technology for increased comfort and customized compression for further immobilization of the lower leg, ankle and foot to assist in the healing process. The cushioned heel provides for greater shock absorption. Used by orthopedists, podiatrists and physical therapists post-surgery and during rehabilitation following trauma and injury of the leg/ankle/foot. o Specially designed removable toe guard provides ideal coverage and added protection of the foot and toes. This Closed-Toe design is Workers Comp approved, allowing you to get back to work faster. o Universal Fit, this boot fits either the Left or Right foot. 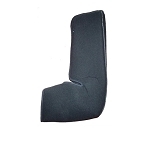 Specially designed removable toe guard provides ideal coverage and added protection of the foot and toes. This Closed-Toe design is Workers Comp approved, allowing you to get back to work faster.